A final pas de deux to round out the dance. Jennet was exhausted from the interviews she’d given that afternoon. Thankfully, Michael loved the limelight and was happy to discourse at length on the implications of the papyrus for Pauline studies. He even suggested that it could cause Roman Catholics and other Christians to rethink women’s priestly roles. Jennet wasn’t holding her breath on that one. George smiled and his face assumed the expression of decanal pride that he favored on occasions like this. “I always say that our faculty here at Parnell State University are top-drawer, and this discovery by Prof. Thorne proves it yet again. The Classics department will be organizing an academic conference on the papyrus and inviting world-class scholars to continue the discussion.” Michael winked at Jennet when he heard this, and pulled a bouquet of paper flowers from his sleeve to present to her on camera. “I thought we’d eat early at Le Bec-Fin in Philly and then take in some Baroque chamber music. If you’re interested, that is,” he said, sounding nervous, as though he thought she might refuse. Jennet caught her breath. Le Bec-Fin was one of the best restaurants in Philadelphia, and from what she’d heard, very romantic. “I’d like that,” she said. “Good. I’ll pick you up at five,” he replied, and hung up. She had the rest of the week to ponder the meaning of this new development, and to consult with Kyle on what she ought to wear to Le Bec-Fin. On Saturday, Jennet felt oddly nervous, as though it was a blind date. She’d decided on a sleeveless dusky rose-colored sheath with a deep scoop neck. Her arms were toned enough to get away with it, and she had a matching bolero jacket to wear indoors in case it was chilly. With this she wore a pair of black heels and a simple rhinestone necklace and earring set with the requisite amount of sparkle. She had sheer black stockings, and new, lacy black underwear. Her hair was fluffed into a flirtier style than she usually wore. She let the stylist shape her eyebrows, but refused an offer to make her up. Cosmetics weren’t her style, though she did favor a little floral perfume from time to time. She dabbed on some Vera Wang Bouquet, the same scent she’d worn the first time she met Stefan. She didn’t know how the evening would end, but just in case, she packed a little tote with a change of clothing to leave in the Land Rover while they were dining. When she opened the door, she was stunned. Jonathan was wearing a navy suit, with the faintest of pinstripes, that dazzled on his tall, slim, muscular frame. She’d never seen him in a tie before. The one he wore now with his crisp white shirt was a silky burgundy charvet. The biggest surprise was his hair. He’d had it trimmed short around the sides and back. Only the chestnut layers on the crown of his head, full and wavy, hinted at its former glories. A stray lock curled over his forehead. It was disorienting, as though he’d shaved a bushy beard to reveal suddenly smooth cheeks. “Oh! I think I’m going to miss your hair,” she told him. “But that style makes you look… younger.” His scar was more noticeable now, giving him a rakish look. He was so handsome, in fact, that her knees felt a little weak. “Does it?” he said, stepping in the door. “I thought it was time for a change.” He handed her a little pot full of paperwhite narcissi. “My mother used to grow these. The scent… reminds me of the way you smell sometimes.” She thanked him and set the paperwhites on the kitchen counter. She couldn’t stop staring at his blue eyes, which glinted like jewels in the low light. She wanted to run her hands through his hair. Would the hair above his collar be as soft as it was before? He opened the passenger door of the Land Rover for her and helped her in. On the way to Philadelphia, they chatted lightly of the papyrus and Michael’s blog entry, and the reporters from CNN and CBS and the Chronicle of Higher Education. Stefan had been in his element, said Jonathan, and was now a minor celebrity in the retirement home. He’d even attracted a large number of female admirers. “Unlike his son,” said Jonathan. “Not at all. Jonathan, why do you say that? You’re the most charming man I’ve ever met.” Not to mention the best-looking. She thought back to the day she’d met him, and the way he abruptly veered off toward the library rather than accompany her back to Chester Hall. Yes, he had struck her as rude and annoying. But even then, she’d found him exciting. They pulled up at Le Bec-Fin, and Jonathan gave the keys to the valet. He escorted her in and they were seated at a white linen-clad table. The long, cream-colored dining room was decorated in grand traditional style, with chandeliers, wall sconces, and panels of flocked wallpaper. Their table was bathed in a golden light. They ordered the prix fixe menu, which consisted of eight small courses, from a truffled omelette, to celery root agnolotti, to striped bass with pickled lemon and chicken with artichoke fondue, as well as cheese and dessert. After some consultation with the sommelier, they settled on a Meursault, one of the more reasonably priced choices. The look in his eyes made the tears well up in hers, and she blinked them back. Somehow, he had finally exorcised the ghost of Lorraine, the woman from his past. Her thoughts went to the chain he always wore. Was it there still, under his white shirt and tie? Or was it gone now, banished for good? “Speak for yourself,” she said, laughing. She caressed the long fingers of his left hand. “I didn’t think I’d hear that so soon. Maybe not ever. Probably not ever.” A tear ran down her face. “And a concert,” she said, dabbing at her face with her napkin, and hoping her nose wasn’t turning red. Notes: Jonathan’s glory was his hair, but it also represented the past. Instead of the symbolic “haircut” he got last time around, I wanted him to be empowered enough to cast it off himself, together with his inhibitions about loving a woman. He has a lot of catching up to do. Swetnam’s seven laws of fencing are taken from his 1617 book The School of the Noble and Worthy Science of Defense. 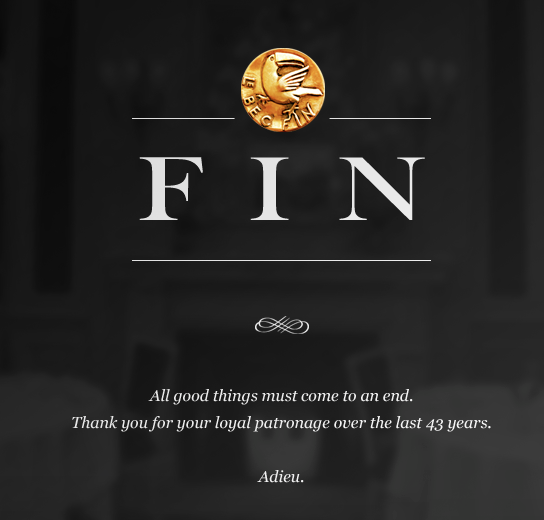 Le Bec-Fin was a real restaurant in Philadelphia, a landmark that closed in 2013. Heartfelt thanks to all the readers who stuck with me to the happy end! Oh no, it’s over!!! I didn’t expect it so soon. But I love a happy ending, and it is very satisfying to think that Jonathan is now ready to commit. No loose ends. Happy ever after. Yay!!!! My Monday routine is safe! Looking forward to that! I love her clothes by the way. Thank you for a lovely read and it is such a treat to have something to look forward to on Mondays! When I imagined him with short hair, he looked good! (In my mind’s eye, Hariclea–LOL.) Thanks for reading. What a nice tease. But…over? What about the hotel? 😉 Now I’m just teasing. I loved it. Thanks for reading Cheer! I’m so glad you enjoyed it. Thank you for being a faithful reader! I hope you enjoy the next one too (no sword fighting, though).